If you or someone you know is suffering from hair thinning or loss, scalp itch, or dandruff, book now to learn more about ScalpCheck®, an analysis to discover the true health of your hair and scalp. Step 2 – Check Important Scalp Values: With the assistance of three special, noninvasive probes, we test for the scalp’s oil level, hydration and pH. The combination of this data guides us in the direction toward a custom treatment plan for our guest. 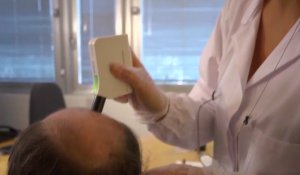 Step 4 – Scope the Scalp & Hair: A specialized video scope with three different lens magnifications allows our certified Trichologist, and you, to view your scalp on a large screen, in order to help further identify problems and create a benchmark that we can review after treatments begin. Once finished, the guest is given a specific custom treatment protocol that includes a combination of in-center and at-home scalp treatments. At the end of the average two or three-month treatment protocol period, the guest returns to get their hair and scalp reassessed to determine what, if any, further courses of action are needed.